The New Jersey state flag, although it had been in use since the time of the American Revolution, was officially adopted in 1896 as the state flag and is based on a 1779 New Jersey Revolutionary War standard George Washington chose to represent the state’s troops. The colors are a buff background and Jersey blue and are ROUTINELY misrepresented on the web and in real life. The State seal in the center of the flag was modeled after the insignia of the Netherlands who were the first European settlers in New Jersey. The following are several examples of the erroneous depictions of the New Jersey State Flag on the web. In addition to the ones shown below, there have been flags with gold for the background and various other shades of yellow and orange. 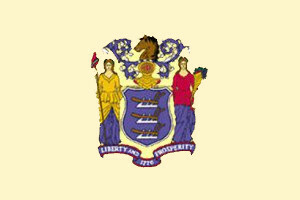 Unless the background is a buff color – it is NOT a valid representation of the New Jersey State Flag. 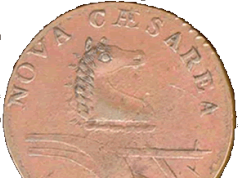 The seal was designed by Pierre Eugene du Simitiere and presented in May of 1777. It represents the agricultural heritage, strength and freedom of New Jersey. It contains a horse’s head at the top which stands for speed and strength, a knight’s helmet which faces forward representing New Jersey’s sovereignty and self-government and in the center a shield with three plows to represent the strong agricultural heritage of New Jersey. On either side are two goddesses representing the State motto, “Liberty and Prosperity”. On the left is Liberty holding a staff with a liberty cap on it. The liberty cap was worn as a symbol of rebellion by patriots during the Revolution. The figure on the right is Ceres, the Goddess of Agriculture and Fertility. She is holding a cornucopia, filled with a bountiful harvest which symbolizes the abundant produce of New Jersey. Beneath them on the banner is the State motto, “Liberty and Prosperity” and in the lower fold appears “1776” signifying the year of independence from Britain. New Jersey declared independence on July 2, 1776 with the signing of the state’s 1776 Constitution. State Song: NONE – contrary to popular belief – New Jersey does NOT have a state song and is the ONLY state not to have one. Previous articleNew Jersey 350th – Fun Fact – So where did New Jersey get its name and why Nova Caesarea?